Maximum size: about 150 mm (estimated from photo). Identification: This is a flattened, firm-textured, cream dorid intricately flecked with light brown. The light brown flecks transition to dark brown on the rhinophore sheaths and the margin of the notum. 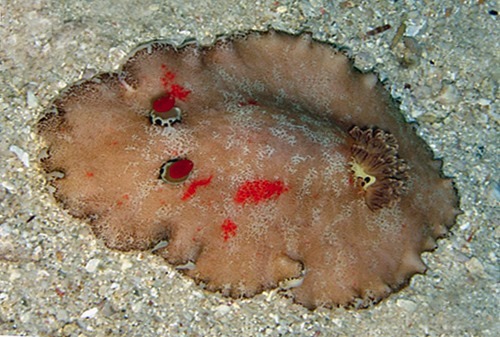 The rhinophores are red and there are red blotches on the underside. Some animals also have red blotches on the notum. Natural history: Platydoris formosa is a moderately rare species found in tide pools and subtidally to 20 m (66 ft) at moderately exposed to highly exposed rocky sites. A pair of large animals found together appeared to show trailing behavior in a holding bucket. Scott Johnson also observed trailing in the field on June 2, 1984 off Makua Beach, Oahu. It lays a pale orange egg mass that hatches in about eight days in the laboratory. Taxonomic notes: This species is referred to as the "speckled platydoris" in Hoover, 1998 & 2006 (deleted in 5th printing). It was first reported in Hawaii from Ala Moana, Oahu in Dec., 1961 (Kay & Young, 1969). Photo: Andy Schwanke: Molokini Islet; May, 2005.